The Ladies Emigration Society has promised free land and independence in exchange for ladies to journey to Nebraska and homestead the land. Sixteen ladies band together and board a train headed to Nebraska. They know that there will be plenty of challenges – building a homestead, providing income for themselves and a plethora of other possibilities. What these ladies do not know is that they have been marketed as eligible young women interested in marriage. Plum Grove, Nebraska, is the last stop before the ladies' destination and it is here the ladies learn on the plan to be marketed as brides. Refusing to go on, several of the ladies stay in Plum Grove and must decide whether to stay or to return to the East. The future of each of these ladies holds promise, love, choices and challenges. Will each of them have the courage to take hold of their own future and obtain the independence that they were promised? 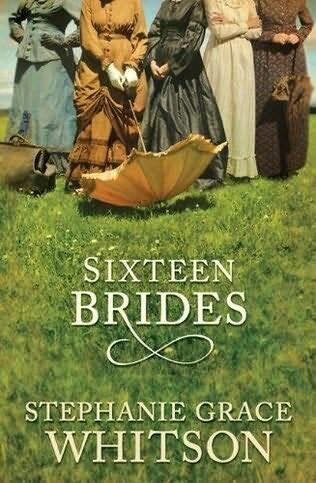 Sixteen Brides was enjoyable to read. I have to say that I'm glad the author did not actually attempt to cover each life of each of the sixteen women. She conveniently dismissed a few of them and chose to focus in on about six of them. I liked this book, though I found it a little too unauthentic in that each of the women find the perfect mate for them. In reality, I can not imagine that happening though I suppose it could. It was a cute story. Perfect for curling up under a blanket on a rainy day.